In a recent LA Times article, a photo gallery is posted of The MuttShack’s pet adoptions. 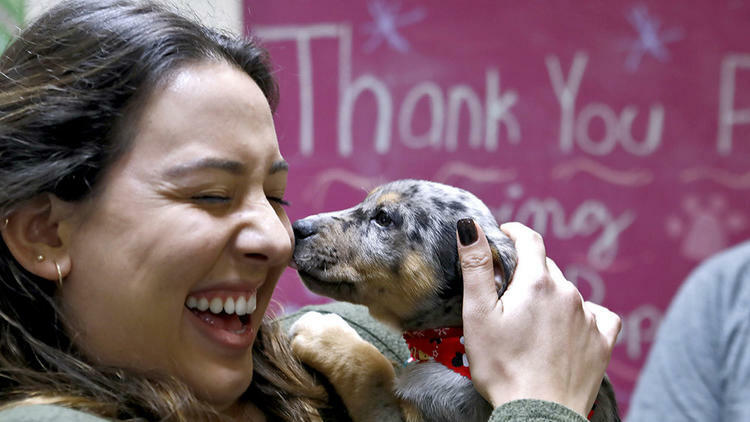 The Muttshack Animal Rescue Foundation brought about 20 puppies ready for adoption and more than 40 people waited in line a long as a couple of hours to get a chance to take one home. The MuttShack had eight volunteers assisting customers in adopting the dogs as swiftly as possible. There were about 40 people waiting outside the pet store at 3525 W. Victory Blvd. before the business opened that morning, according to event organizers. They were there for a weekly event held by the Muttshack Pet Adoptions, an area animal-rescue nonprofit. Martin St. John, Amanda St. John’s husband and the other co-founder of the Muttshack, said many of the dogs the organization puts up for adoption come from people whose dogs have given birth, but they do not want to keep the litter or from low-income neighborhoods where there are pets who can no longer be cared for. See full article and photo gallery.